Non-EEA nationals who normally need a Schengen visa, yet have a residence permit/long-stay national visa in one of the Schengen countries generally do not need to apply for another Schengen visa to visit the other Schengen countries while that permit/visa is valid. However, their visit in the other Schengen area countries will still be limited to the standard 90-day per 180-day period. Work or residence rights are also not extended outside the country that issued this long-stay visa. Once you are allowed into the Schengen zone, you can generally travel to any member state without having to go through formal passport control procedures again. When using a plane to travel between two airports within the Schengen area, it will be as if you are taking a domestic flight. There are, however, a few exceptions to this. For instance, if you wish to travel between two Schengen cities with certain non-EU-based carriers, you may need to clear passport control in both cities and as a consequence, may need a multiple-entry visa. When booking intra-Schengen flights operated by non-EU carriers, please take note of this or consider booking a flight operated by an EU-based carrier instead. Some countries like France, Italy and the Netherlands require non-EU/EEA/Swiss nationals to declare their presence to relevant local authorities even if they arrived from another Schengen member state. This may be taken care of by the accommodation you are staying at upon check-in, but otherwise you will have to visit the relevant authorities yourselves. Consult the Wikivoyage pages of the individual countries as well as the websites of their respective immigration authorities for more information. The Schengen agreement also has provisions for allowing individual member states to temporarily reinstate border controls in certain circumstances. For instance, as a result of a 2015-2016 influx of refugees, train passengers in Denmark headed for Sweden need to submit to a brief passport check on the train upon arrival at the first station in Sweden. In addition, expect random passport checks when crossing borders at any time, as well as when boarding a plane at the airport. Hence, even if there are no border (immigration) controls between Schengen states, you are strongly advised to carry your passport with you when crossing borders between Schengen states. 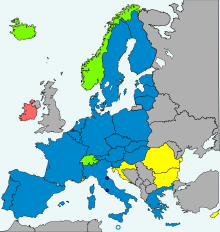 Norway, Switzerland, Iceland, and Liechtenstein, while in the Schengen area, are not in the European Union and, accordingly, customs controls are in effect for all arriving travellers, regardless of point of origin. On some borders the controls are lax and you may have to make sure you find a customs official to declare goods needing customs clearance. Åland, while a member of the EU and Schengen as part of Finland, is not a member of the tax union and you should thus declare some imports, even when there is no customs where you happen to pass the border. Similar considerations apply to the Channel Islands and some other areas. When crossing the border by train, customs officers may enter the train; and when crossing by car, customs officers may stop your vehicle and inspect it. It is possible that inspections may happen twice in a single journey: once by the customs officers of the outgoing country and another by the customs officers of the incoming country. Normally, if transiting through an airport in one of these four countries, you may not be required to clear customs in the transiting airport.